13-Aug-2016 -- This is the first out of four reports reaching confluence points in Croatia, Austria, and Hungary. Friday after work I took a flight from Zurich to Zagreb arriving there at 11:30 PM with two hours delay due to a previous collision between the plane and a bird. The delay didn’t matter much after it had been unclear for a while if the plane will fly at all or be cancelled. As usual, I had brought my bicycle with me, such that I could directly cycle out of the airport. It only took me 10 minutes to unbox my bike and hit the road. I spent the night in a private bed-and-breakfast place in the southern part of Zagreb. The next morning after having had breakfast in Zagreb, I crossed the Park prirode Medvednica, which is located north of Zagreb and south of this confluence point. The ridge is about 1000 m elevation, such that I had a tough exercise for the morning. After coasting down the mountain range and passing through the town Donja Stubica, I reached the confluence point easily. It is located 11 m from a minor road with the name Lepa Ves on a private plot of garden land. The owner was present. Even though he was not sharing any language with me, I was able to explain him my mission. I am not sure how deep he got the concept of confluencing, but I guess rather less. The exact spot of the confluence is on a steep slope with mown grass. 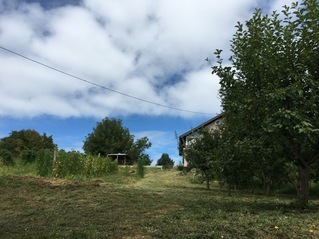 Nearby are planted beans and apple trees. The visit was really quick. A couple minutes after I had arrived I was on the road again – heading north in order to visit my last unvisited confluence in Austria. The story continues at 47°N 16°E.